A bunker, which is now called Bunk'Art but was originally built by Albanian communist leader Enver Halil Hoxha as protection against possible nuclear attack, has been reopened upon tremendous interest. Located in the Albanian capital Tirana, the nuclear bunker was open to visitors only once by the government during the 70th anniversary celebrations in 2014 for Albania's freedom from Nazi occupation. But now Bunk'Art is reopened to visitors with initiatives by nongovernmental organizations in Albania. Eva Haci, the representative of the institution that manages the bunker, spoke to Anadolu Agency (AA) and said that the great interest of local and foreign tourists in the bunker that was built 38 years ago by the communist regime in Albania, helped them to reopen it. Haci said that the bunker was open for visitors for two months only in 2014. "Bunk'Art was visited by more than 60,000 local national and foreign tourists in the two months it was open. About a month ago, the bunker reopened and we welcome a great number of tourists every day." An Australian tourist named George who was visiting the bunker told AA that he previously had information about the history of the bunker and he specifically wanted to visit the site while in Albania. "I traveled around Europe but this bunker is an interesting spot for especially foreign tourists." Signa, an Austrian tourist said it was an impressive experience to visit the bunker. Built in 1978, the only nuclear bunker in the country, features private rooms for Hoxha and then Prime Minister Mehmet Shehu. The five-story facility, which was named Facility 0774 by the communist regime, has 106 rooms. 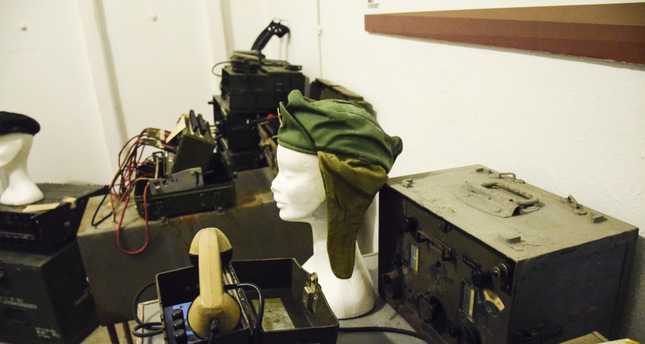 There are numerous historical items, including weapons, uniforms, maps and documents in the bunker that are on display for visitors. Although Bunk'Art is the only nuclear bunker in Albania, the communist regime in the country had a total of 170,000 bunkers built in order to protect the people against possible military attacks.